Today isn't about sheet masks, or any kind of masks, but a serum. A vitamin C serum to be exact. The last vitamin I spoke about was the Radha Beauty Vitamin C Serum, which had 20% Sodium Ascorbyl Phosphate. This also has 20% SAP, but with 11% Hyaluronic Acid, and Witch Hazel. 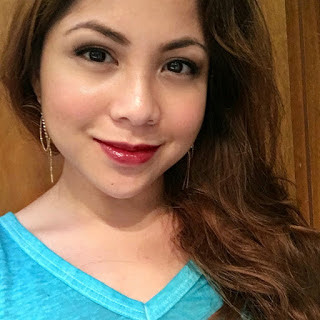 The product is by a beauty company called Miradaz, and I was contacted to see if I would like to try one of their serums. I love a good vitamin C serum, and looked up their website, www.Miradaz.com, immediately. I replied with a yes, and later received a package with their Vitamin C Serum, Wonder Serum, and a lovely handmade rosemary shea lotion bar, aka soap (smells refreshing btw). I will be focusing on the Vitamin C serum. Vitamin C is water soluble vitamin and a powerful antioxidant. It helps maintain the connective tissues in our body, like in our cartilage and bones. It can be used topically as a serum or a pharmaceutical grade pill. In skincare, build up collagen in the skin, and can lighten dark spots, or post acne marks. It's also great for anti aging, helps skin tone and makes it feel and look firm. I honestly believe that this is a great secret weapon for those with oily, and/or acne prone skin. I love a good vitamin c serum because it helps with my large pores that always seem to get clogged. It is a holistic brand that sells products with natural and organic ingredients. They currently sell the Wonder Serum, Vitamin C serum, and an array of oil difffusers in the form of a necklace. Miradaz was founded on the belief that everyone deserves to feel healthy, beautiful about their own self and their home. Our mission is to provide holistic and natural skin care products, healthy supplements and beautiful home products at an affordable price. We are committed to using natural and the finest ingredients with no harmful synthetic chemicals. Miradaz started out as nothing more than a hobby performed in the kitchen of the founder’s apartment. We have one goal and that is to use high quality, natural and organic ingredients to produce a holistic and natural product for your beauty, health and home. 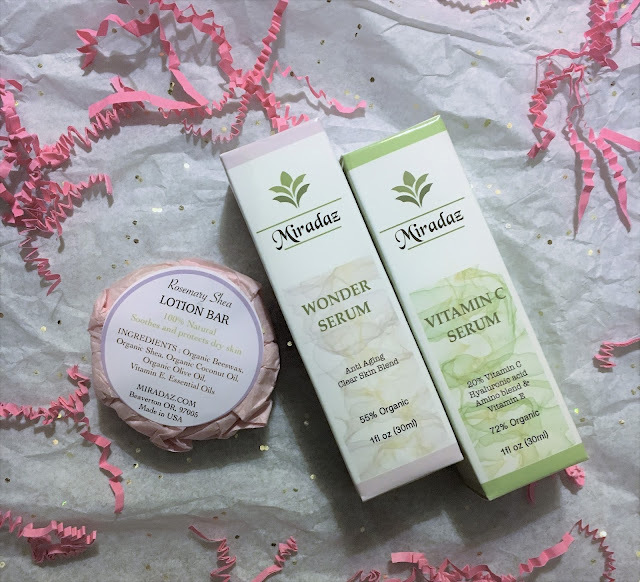 In an ever growing market of questionable quality and ingredient sourcing, Miradaz is a company that is striving to produce high quality and natural products for your skin, health and home. Protects and restores skin by providing up to eight-fold antioxidant protection, ninety-six percent reduction of sunburn cells, and prevention of the formation of free radicals in sun exposed skin. Fades sun spots and discoloration, refines skin texture and reduces wrinkle formation as well as minimizing existing wrinkles. It's vegan and cruelty free, which means that they do not use animal ingredients or animal derived ingredients in their products, nor have they tested them on animals. The Packaging is standard. The box is simple and pretty, and the 30 ml (1 oz) bottle is dark so the light doesn't come through to ruin the serum. In a previous post, I had talked about vitamin C looking yellow to orange, which means it's garbage and can't be used. The Miradaz Vitamin C Serum arrived in the right color; it was clear, like water. The serum is clear and watery, just the way I like my vitamin C serums. It has a silky finish, and absorbs really well in to my skin. It has a dropper, which makes it easy to control the amount you need or want to use. The only con is that you have to remember to close the bottle tightly because the longer it is exposed to air, the faster oxidization will occur. I have tried it several ways, since it does have a silky finish. This is just how I tested this serum, so you don't necessarily have to follow it. I also use my fingers to apply and pat the serum onto my skin. The best way to use a vitamin C serum is to put it on bare skin, before anything else, but it still works great before or after a toner. If you use it after an essence or serums, absorption in to the skin will decrease and the results will not be as good. Wash and pat skin dry. If using a toner, apply toner first. Apply a small amount os erum with fingertips to entire face, neck and decollete. Allow to dry. Follow with a moisturizer. Can be daily, morning or night. Deionized Aqua (Water), Sodium Ascorbyl Phosphate (Vitamin C), Hamamelis Virginiana Water (Witch Hazel), Cassia Angustifolia Seed Polysaccharide (botanical hyaluronic acid), Dimethyl Sulfone (MSM), Tocopheryl Acetate (Vitamin E), Aloe Barbadensis Leaf Extract (Organic Aloe), Phenoxyethanol, SD Alcohol 40B, (2s)-2-Amino-5-guanidinopentanoic Acid, Acrylates/C10-30 alkyl acrylate Crosspolymer, Ethylhexylglycerin, Ferulic Acid, Glycerin (Kosher, Vegetable), Simondsia Chinensis Oil (Organic Jojoba), Centella Asiatica Extract (Organic Gotu Kola), Equisetum Arvense Extract (Horsetail), Taraxacum Officinale Extract (Dandelion), Geranium Maculatum Extract (Wild Geranium). The first three ingredients are Water, SAP, Witch Hazel. I personally would have liked having more the Organic Aloe (7th on the list) than water, but I'm not complaining. SAP or Sodium Ascorbyl Phosphate is a naturally occurring water-soluble derivative of vitamin c, made from the stablized sodium salt of LAA, and so it is considered a stable precursor and doesn't degrade in formulas containing water (1). It has a high pH, which is usually around, but this vitamin c serum has a pH of 7.5, unlike LAA (L-Ascorbic Acid), which needs a pH of 3.5 or less to penetrate the skin, takes a while to absorb in to the skin, and oxidizes much faster. Yup, Sodium Ascorbyl Phosphate will last much longer than a few months (2). It's also more gentle than LAA, which you have to gradually introduce into your skincare. This is more stable than MAP and LAP (3,4). SAP is also great for acne. I first posted about this on my instagram, which is also linked to the Miradaz website. Also, please remember that it takes a while to see great results, usually between 3-6 months. Using a vitamin C serum with HA is great for anti-aging, fighting wrinkles, but you should also wear sunscreen during the day, which is another way to fight aging btw. they have a new Instagram account, as well a twitter account.